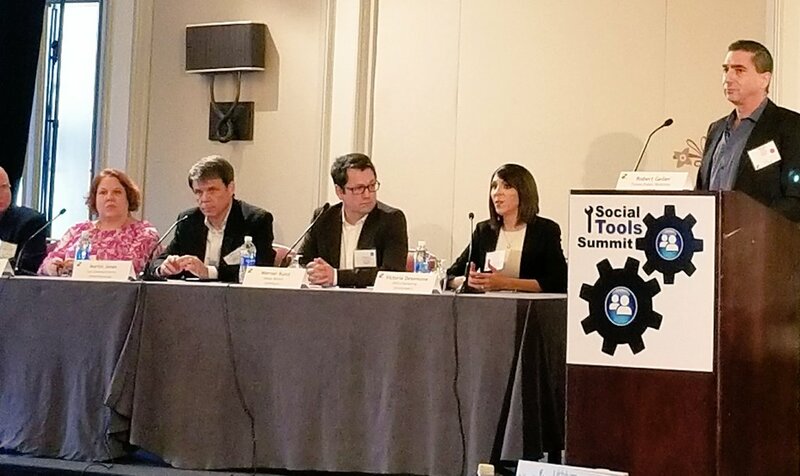 I enjoyed attending my third consecutive Social Tools Summit event in Boston last week, where I moderated a panel on branding and thought leadership. It was great to take a day and get caught up on the state of the art in social media. The field is constantly changing, and there’s never a shortage of new tech, challenges and opportunities. The day featured panels on just about every aspect of the field. Experts and practitioners from big and small companies, education, non-profits, etc., chimed in on case studies and best practices. Social Tools may not be the biggest or splashiest event – but it fosters great dialog, networking and learning. My panel covered areas ranging from video, to engaging people with live events and products, and influencer and content marketing. You can see the curated tweets below. Thanks to the panel for making it a great session: Jody Krasner Gladstein, Werner Kunz, Mark Traphagen, Martin Jones, and Victoria Desemone. Two social “Trenders” presented opposing views and kept the rest of us honest: Rachael Cobb and Sonia Mahnot. Conference co-organizer Neal Schaffer delivered a stellar keynote on the importance of alignment of social media with other objectives. He also mentioned his forthcoming book, The Business of Influence, which I am excited about. And it was great hearing from Damian Keyes, founder of DK Music Management, on the future of influencer marketing.